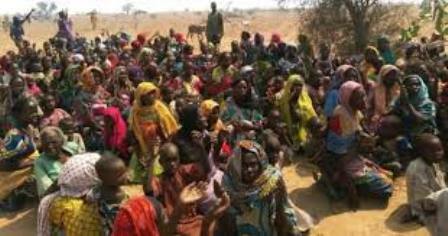 Nigerian troops have reportedly rescued over 5, 000 Boko Haram hostages and killed ten of the terrorists in several clearance operation in the North East. Report said one Civilian JTF member was killed, a soldier, policeman and another Civilian JTF member were injured during the encounters, while arms, ammunition and logistics equipment in large quantities were recovered from the terrorists. The Acting Director of Army Public Relations, Colonel Sani Usman, confirmed the rescue operations in a statement. He said: “Troops of 21 Brigade and Civilian JTF weekend conducted a fighting patrol to Zangebe, Maiwa, Algaiti and Mainari villages in which they killed 6 Boko Haram terrorists and wounded several others," he said. “The troops also liberated over 5,000 persons held hostages by Boko Haram terrorists and recovered 5 motorcycles and similar number of bicycles”. “Similarly, troops of 7 Division Garrison Rapid Deployment Force (RDF) II, in conjunction with some of elements of Mobile Police Force and Civilian JTF today also conducted Boko Haram terrorists clearance operations at Masu Yiwa, Ladin Buta, Bazaka, Kesa Gala, Tabla, Fahinde, Shirori, Gizina, Maska Aribe, Maska and Maska Lawanti villages, all in Mafa Local Government Area of Borno State," Usman said. He further stated that “during the clearance operations, the troops encountered Boko-Haram terrorists at Maska Lawanti in which they killed 2 terrorists and recovered 2 motorcycles." He said: “Unfortunately, we lost 1 Civilian JTF, while a soldier and 1 Mobile Policeman were wounded in action. The body of the heroic Civilian JTF and the wounded soldier and his police counterpart has since been evacuated to Maiduguri. “While we commiserate with the families of the departed Civilian JTF, we wish to state that the wounded are in stable condition and responding to treatment. “In a related development, troops of 192 Battalion, 26 Task Force Brigade and some vigilantes also embarked on fighting patrol along Kusarha-Zalidava general area today (Saturday)." He said the patrol team encountered some of the terrorists around Zalidava-Weige villages in which they killed two of them and recovered one General Purpose Machine Gun (GPMG) with registration number FN 132125, a belt of 7.62mm (NATO) ammunition containing 42 rounds.